Surya Mallapragada says the bio- and bio-inspired materials developed in her lab have a lot of potential to improve human health. Larger photo. Photo by Christopher Gannon. 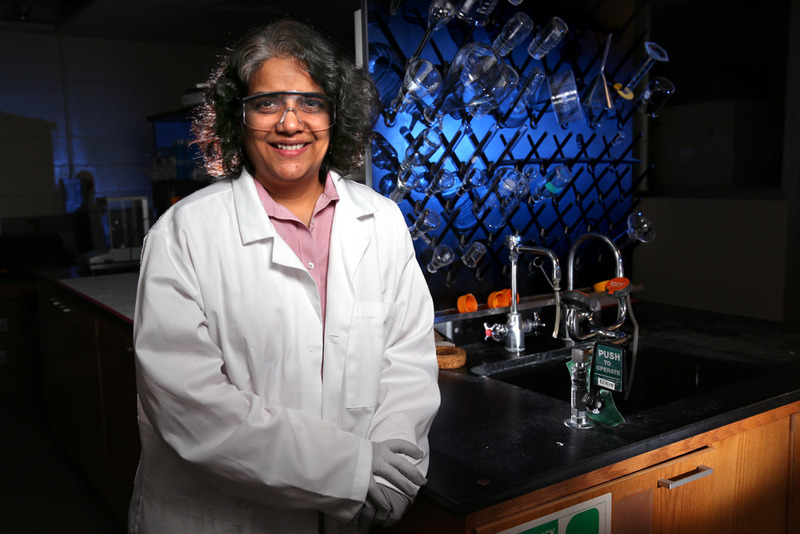 AMES, Iowa – Surya Mallapragada believes in the power and potential of bio- and bio-inspired materials to improve human health. She’s been researching the materials and how they can solve biomedical problems for nearly two decades. And there are good reasons for sticking with the studies. What, exactly, can these materials do for people? Researchers are also using the bio- and bio-inspired materials in new vaccine technologies. Mallapragada, in fact, is a research partner of Iowa State’s Nanovaccine Initiative, a bench-to-bedside research collaboration launched in 2013 with a three-year, $1.2 million grant from Iowa State’s Presidential Initiative for Interdisciplinary Research. Smart polymers that have charge and gel-forming characteristics that make them ideal for delivering suicide genes to cancer cells. Nanoscale, polymer devices that provide sustained delivery of single-dose vaccines. Polymers added to vaccines as adjuvants that enhance the response to sub-unit vaccines based on proteins, DNA or other parts of a virus. Hybrid materials that combine the lab’s hydrogels with other biodegradable nanoparticle platforms developed in the Nanovaccine Initiative to improve the effectiveness of vaccines. Nanocomposite materials that can be used in hip implants or cartilage repair. Biodegradable polymer substrates featuring tiny patterns and channels that help nerves to bridge gaps and regenerate. The research projects have been supported by the National Science Foundation, the National Institutes of Health, the U.S. Army and the U.S. Department of Energy. Mallapragada said many of the projects are inspired by the structures and materials found in nature, such as the chains of magnetic nanocrystals found in the tissues of many species. Additional progress could open the door to materials produced under mild temperatures and conditions; materials produced with greater control of size, shape, chemistry and crystal structure; and materials engineered for highly specific applications in medicine, sensors, ceramics and other fields. Surya Mallapragada and her research group are developing polymers and nanocomposites with a variety of medical applications, including delivering suicide genes to cancer cells, providing sustained delivery of vaccines, improving the effectiveness of vaccines, reducing the wear of hip implants and helping nerves regenerate.